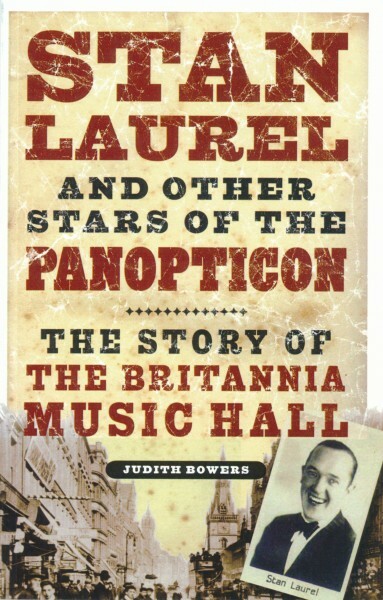 The glory days of Scottish vaudeville are resurrected with all their laughter, clamor and craziness in STAN LAUREL AND OTHER STARS OF THE PANOPTICON--THE STORY OF THE BRITANNIA MUSIC HALL, by Judith Bowers. Bowers, a Glasgow-based archaeologist-turned-theater historian, discovered the Britannia in 1992 when she was working in the Trongate section of Glasgow. Trongate, once a thriving business center, had fallen into hard times during the early part of the 20th century and had only recently undergone gentrification. Prominent was a three-story building that Bowers describes as "an old Victorian lady in her crinoline, past her prime, but still standing stoic and sublime." The building's ground floor was being used as an amusement arcade; the other two floors had long been sealed off. It took her seven years of importuning and finagling to get permission to explore the rest of the building--but her persistence finally paid off, in a big way. For there, covered in dust and filth, piled high with boxes and rubble, was a reasonably well-preserved music hall--one of the oldest and most famous theatres in all of the United Kingdom. Opened in 1867, the Britannia provided entertainment to Glasgow's working class--"the men who worked in the shipyards, mills, mines and factories ten hours a day, six days a week, earning about 3 shillings 6d a day, minus fines for late attendance, slovenly work, accidents and anything else a boss could think of to reduce his wages bill," writes Bowers. The workers were a rough bunch and they liked their entertainment rough as well--raunchy comics, semi-naked female dancers, acrobats, cockney singers and Japanese jugglers. "The audience sat together in a human herd, munching and mooing in the gas-lit dimness as they drank their beer and prised steaming whelks (the first popular take-away food) from their shells. The atmosphere was thick with Woodbine smoke and the smell of people," relates the author. Prostitutes plied their trade in the dark corners of the balcony. People often hooted at performers or tossed things at them. Drunks would stand up and piss down on the audience below. Under pressure from the city fathers and the church, the Britannia began to clean up its act, regulate the ruffians, make the hall more family friendly (although ladies' toilets were not installed until 1920). Classier comics like The Great Vance, W.T. Frame and George Leybourne were hired, plus entertainers like Jack Buchanan, Bessie Bellwood and Jennie Hill. Minstrel shows became popular, likewise hypnotists and magicians such as "Dr Walford Bodie, MD and his 'electric chair' act. The most famous name to come out of the Britannia was Stan Laurel. Born Arthur Stanley Jefferson, Laurel was a disciple of W. T. Frame, who encouraged him to take turn professional. Laurel debuted at the Britannia at sixteen, then toured with a pantomime called "Sleeping Beauty," followed by a stint with Fred Carno's famous "Mumming Birds," whose lead actor was another wannabe showbiz star, Charlie Chaplin. They soon became friends and when Chaplin was invited to Hollywood, Laurel followed. "During the period that Stan was writing and performing in his own short films, another young man was beginning to attract the attention of the Hollywood studios, Oliver Norvall Hardy...Hal Roach decided to cast Hardy as one of the characters in a film called "Slipping Wives." Stan Laurel wrote most of its gags and also played a minor role alongside Roach's new find. Stan and Ollie stole the film and the rest, as they say, is history." Even more important to Britannia's success was A.E. Pickard, the P.T. Barnum of Glasgow. It was the cheeky, bigger-than-life Pickard who came up with the Panopticon idea--the word comes from ancient Greek: Pan means everything; optikon means visible or seen. In Pickard's Panopticon people could "see everything" for one ticket price. That included wild animals and reptiles, artworks, distorting mirrors, performing chimps, freaks (Tom Thumb, The Fattest Woman on Earth, The Human Spider)--and of course a rollicking music hall show. Ever the showman and huckster, Pickard booked acts like "Babette the Wonder Child" and "Lady Mansell's Juvenile Follies." He also served as the M.C., trading wisecracks and insults with performers and audiences alike, wielding "the hook" to banish an unpoular act. He loved to pull stunts and outrageous practical jokes, managing at the same time to cannily buy property all over Glasgow and become one of the richest men in town. The whole fantabulous history of the Britannia Music Hall is recounted by Bowers in her well-researched, pungently-written book. The Britannia closed its doors in 1938 after a brief spell as a movie house, but thanks to Bowers' efforts (and the help of private donors and a charitable trust), it has done a Lazarus and risen from the grave. Partially restored to its former glory, the Britannia plays host to cabaret acts, Laurel & Hardy film nights, burlesque shows, exhibitions and straight plays. "Meanwhile," as Bowers concludes, "I work in Pickard's former office. I can hear the sound of the modern city below, but am just steps away from the auditorium--my own Narnia--where the magic of the music hall lingers on."